Remnants of the Farallon Plate, deep in Earth's mantle. It is thought that much of the plate initially went under North America (particularly the western United States and southwest Canada) at a very shallow angle, creating much of the mountainous terrain in the area (particularly the southern Rocky Mountains). Plate tectonics (from the Late Latin tectonicus, from the Greek: τεκτονικός "pertaining to building") is a scientific theory that describes the large-scale motion of Earth's lithosphere. This theoretical model builds on the concept of continental drift which was developed during the first few decades of the 20th century. The geoscientific community accepted the theory after the concepts of seafloor spreading were later developed in the late 1950s and early 1960s. The lithosphere, which is the rigid outermost shell of a planet (on Earth, the crust and upper mantle), is broken up into tectonic plates. On Earth, there are seven or eight major plates (depending on how they are defined) and many minor plates. Where plates meet, their relative motion determines the type of boundary; convergent, divergent, or transform. Earthquakes, volcanic activity, mountain-building, and oceanic trench formation occur along these plate boundaries. The lateral relative movement of the plates typically varies from zero to 100 mm annually. Tectonic plates are composed of oceanic lithosphere and thicker continental lithosphere, each topped by its own kind of crust. Along convergent boundaries, subduction carries plates into the mantle; the material lost is roughly balanced by the formation of new (oceanic) crust along divergent margins by seafloor spreading. In this way, the total surface of the globe remains the same. This prediction of plate tectonics is also referred to as the conveyor belt principle. Earlier theories (that still have some supporters) propose gradual shrinking (contraction) or gradual expansion of the globe. Tectonic plates are able to move because the Earth's lithosphere has greater strength than the underlying asthenosphere. Lateral density variations in the mantle result in convection. Plate movement is thought to be driven by a combination of the motion of the seafloor away from the spreading ridge (due to variations in topography and density of the crust, which result in differences in gravitational forces) and drag, with downward suction, at the subduction zones. Another explanation lies in the different forces generated by the rotation of the globe and the tidal forces of the Sun and Moon. The relative importance of each of these factors and their relationship to each other is unclear, and still the subject of much debate. The outer layers of the Earth are divided into the lithosphere and asthenosphere. This is based on differences in mechanical properties and in the method for the transfer of heat. Mechanically, the lithosphere is cooler and more rigid, while the asthenosphere is hotter and flows more easily. In terms of heat transfer, the lithosphere loses heat by conduction, whereas the asthenosphere also transfers heat by convection and has a nearly adiabatic temperature gradient. This division should not be confused with the chemical subdivision of these same layers into the mantle (comprising both the asthenosphere and the mantle portion of the lithosphere) and the crust: a given piece of mantle may be part of the lithosphere or the asthenosphere at different times depending on its temperature and pressure. Tectonic lithosphere plates consist of lithospheric mantle overlain by either or both of two types of crustal material: oceanic crust (in older texts called sima from silicon and magnesium) and continental crust (sial from silicon and aluminium). Average oceanic lithosphere is typically 100 km (62 mi) thick; its thickness is a function of its age: as time passes, it conductively cools and subjacent cooling mantle is added to its base. Because it is formed at mid-ocean ridges and spreads outwards, its thickness is therefore a function of its distance from the mid-ocean ridge where it was formed. For a typical distance that oceanic lithosphere must travel before being subducted, the thickness varies from about 6 km (4 mi) thick at mid-ocean ridges to greater than 100 km (62 mi) at subduction zones; for shorter or longer distances, the subduction zone (and therefore also the mean) thickness becomes smaller or larger, respectively. Continental lithosphere is typically ~200 km thick, though this varies considerably between basins, mountain ranges, and stable cratonic interiors of continents. The two types of crust also differ in thickness, with continental crust being considerably thicker than oceanic (35 km vs. 6 km). Transform boundaries (Conservative) occur where two lithospheric plates slide, or perhaps more accurately, grind past each other along transform faults, where plates are neither created nor destroyed. The relative motion of the two plates is either sinistral (left side toward the observer) or dextral (right side toward the observer). Transform faults occur across a spreading center. Strong earthquakes can occur along fault. The San Andreas Fault in California is an example of a transform boundary exhibiting dextral motion. Divergent boundaries (Constructive) occur where two plates slide apart from each other. At zones of ocean-to-ocean rifting, divergent boundaries form by seafloor spreading, allowing for the formation of new ocean basin. As the continent splits, the ridge forms at the spreading center, the ocean basin expands, and finally, the plate area increases causing many small volcanoes and/or shallow earthquakes. At zones of continent-to-continent rifting, divergent boundaries may cause new ocean basin to form as the continent splits, spreads, the central rift collapses, and ocean fills the basin. Active zones of Mid-ocean ridges (e.g., Mid-Atlantic Ridge and East Pacific Rise), and continent-to-continent rifting (such as Africa's East African Rift and Valley, Red Sea) are examples of divergent boundaries. Convergent boundaries (Destructive) (or active margins) occur where two plates slide toward each other to form either a subduction zone (one plate moving underneath the other) or a continental collision. At zones of ocean-to-continent subduction (e.g., Western South America, and Cascade Mountains in Western United States), the dense oceanic lithosphere plunges beneath the less dense continent. Earthquakes then trace the path of the downward-moving plate as it descends into asthenosphere, a trench forms, and as the subducted plate partially melts, magma rises to form continental volcanoes. At zones of ocean-to-ocean subduction (e.g., the Andes mountain range in South America, Aleutian islands, Mariana islands, and the Japanese island arc), older, cooler, denser crust slips beneath less dense crust. This causes earthquakes and a deep trench to form in an arc shape. The upper mantle of the subducted plate then heats and magma rises to form curving chains of volcanic islands. Deep marine trenches are typically associated with subduction zones, and the basins that develop along the active boundary are often called "foreland basins". The subducting slab contains many hydrous minerals which release their water on heating. This water then causes the mantle to melt, producing volcanism. Closure of ocean basins can occur at continent-to-continent boundaries (e.g., Himalayas and Alps): collision between masses of granitic continental lithosphere; neither mass is subducted; plate edges are compressed, folded, uplifted. 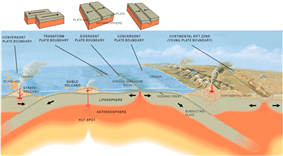 Three types of plate boundary. Plate tectonics is basically a kinematic phenomenon. Scientists agree on the observation and deduction that the plates have moved with respect to one another but continue to debate as to how and when. A major question remains as to what geodynamic mechanism motors plate movement. Here, science diverges in different theories. It is generally accepted that tectonic plates are able to move because of the relative density of oceanic lithosphere and the relative weakness of the asthenosphere. Dissipation of heat from the mantle is acknowledged to be the original source of the energy required to drive plate tectonics through convection or large scale upwelling and doming. The current view, though still a matter of some debate, asserts that as a consequence, a powerful source of plate motion is generated due to the excess density of the oceanic lithosphere sinking in subduction zones. When the new crust forms at mid-ocean ridges, this oceanic lithosphere is initially less dense than the underlying asthenosphere, but it becomes denser with age as it conductively cools and thickens. The greater density of old lithosphere relative to the underlying asthenosphere allows it to sink into the deep mantle at subduction zones, providing most of the driving force for plate movement. The weakness of the asthenosphere allows the tectonic plates to move easily towards a subduction zone. Although subduction is believed to be the strongest force driving plate motions, it cannot be the only force since there are plates such as the North American Plate which are moving, yet are nowhere being subducted. The same is true for the enormous Eurasian Plate. The sources of plate motion are a matter of intensive research and discussion among scientists. One of the main points is that the kinematic pattern of the movement itself should be separated clearly from the possible geodynamic mechanism that is invoked as the driving force of the observed movement, as some patterns may be explained by more than one mechanism. In short, the driving forces advocated at the moment can be divided into three categories based on the relationship to the movement: mantle dynamics related, gravity related (mostly secondary forces), and Earth rotation related. For much of the last quarter century, the leading theory of the driving force behind tectonic plate motions envisaged large scale convection currents in the upper mantle which are transmitted through the asthenosphere. This theory was launched by Arthur Holmes and some forerunners in the 1930s and was immediately recognized as the solution for the acceptance of the theory as originally discussed in the papers of Alfred Wegener in the early years of the century. However, despite its acceptance, it was long debated in the scientific community because the leading ("fixist") theory still envisaged a static Earth without moving continents up until the major break–throughs of the early sixties. Two– and three–dimensional imaging of Earth's interior (seismic tomography) shows a varying lateral density distribution throughout the mantle. Such density variations can be material (from rock chemistry), mineral (from variations in mineral structures), or thermal (through thermal expansion and contraction from heat energy). The manifestation of this varying lateral density is mantle convection from buoyancy forces. How mantle convection directly and indirectly relates to plate motion is a matter of ongoing study and discussion in geodynamics. Somehow, this energy must be transferred to the lithosphere for tectonic plates to move. There are essentially two types of forces that are thought to influence plate motion: friction and gravity. In the theory of plume tectonics developed during the 1990s, a modified concept of mantle convection currents is used. It asserts that super plumes rise from the deeper mantle and are the drivers or substitutes of the major convection cells. These ideas, which find their roots in the early 1930s with the so-called "fixistic" ideas of the European and Russian Earth Science Schools, find resonance in the modern theories which envisage hot spots/mantle plumes which remain fixed and are overridden by oceanic and continental lithosphere plates over time and leave their traces in the geological record (though these phenomena are not invoked as real driving mechanisms, but rather as modulators). Modern theories that continue building on the older mantle doming concepts and see plate movements as a secondary phenomena are beyond the scope of this page and are discussed elsewhere (for example on the plume tectonics page). Another theory is that the mantle flows neither in cells nor large plumes but rather as a series of channels just below the Earth's crust which then provide basal friction to the lithosphere. This theory is called "surge tectonics" and became quite popular in geophysics and geodynamics during the 1980s and 1990s. Slab-pull: Current scientific opinion is that the asthenosphere is insufficiently competent or rigid to directly cause motion by friction along the base of the lithosphere. Slab pull is therefore most widely thought to be the greatest force acting on the plates. In this current understanding, plate motion is mostly driven by the weight of cold, dense plates sinking into the mantle at trenches. Recent models indicate that trench suction plays an important role as well. However, as the North American Plate is nowhere being subducted, yet it is in motion presents a problem. The same holds for the African, Eurasian, and Antarctic plates. Alfred Wegener, being a meteorologist, had proposed tidal forces and pole flight force as the main driving mechanisms behind continental drift; however, these forces were considered far too small to cause continental motion as the concept then was of continents plowing through oceanic crust. Therefore, Wegener later changed his position and asserted that convection currents are the main driving force of plate tectonics in the last edition of his book in 1929. Of the many forces discussed in this paragraph, tidal force is still highly debated and defended as a possible principle driving force of plate tectonics. The other forces are only used in global geodynamic models not using plate tectonics concepts (therefore beyond the discussions treated in this section) or proposed as minor modulations within the overall plate tectonics model. The actual vector of a plate's motion is a function of all the forces acting on the plate; however, therein lies the problem regarding what degree each process contributes to the overall motion of each tectonic plate. The diversity of geodynamic settings and the properties of each plate must clearly result from differences in the degree to which multiple processes are actively driving each individual plate. One method of dealing with this problem is to consider the relative rate at which each plate is moving and to consider the available evidence of each driving force on the plate as far as possible. One of the most significant correlations found is that lithospheric plates attached to downgoing (subducting) plates move much faster than plates not attached to subducting plates. The Pacific plate, for instance, is essentially surrounded by zones of subduction (the so-called Ring of Fire) and moves much faster than the plates of the Atlantic basin, which are attached (perhaps one could say 'welded') to adjacent continents instead of subducting plates. It is thus thought that forces associated with the downgoing plate (slab pull and slab suction) are the driving forces which determine the motion of plates, except for those plates which are not being subducted. The driving forces of plate motion continue to be active subjects of on-going research within geophysics and tectonophysics. In line with other previous and contemporaneous proposals, in 1912 the meteorologist Alfred Wegener amply described what he called continental drift, expanded in his 1915 book The Origin of Continents and Oceans and the scientific debate started that would end up fifty years later in the theory of plate tectonics. Starting from the idea (also expressed by his forerunners) that the present continents once formed a single land mass (which was called Pangea later on) that drifted apart, thus releasing the continents from the Earth's mantle and likening them to "icebergs" of low density granite floating on a sea of denser basalt. Supporting evidence for the idea came from the dove-tailing outlines of South America's east coast and Africa's west coast, and from the matching of the rock formations along these edges. Confirmation of their previous contiguous nature also came from the fossil plants Glossopteris and Gangamopteris, and the therapsid or mammal-like reptile Lystrosaurus, all widely distributed over South America, Africa, Antarctica, India and Australia. The evidence for such an erstwhile joining of these continents was patent to field geologists working in the southern hemisphere. The South African Alex du Toit put together a mass of such information in his 1937 publication Our Wandering Continents, and went further than Wegener in recognising the strong links between the Gondwana fragments. Simultaneous advances in early seismic imaging techniques in and around Wadati-Benioff zones along the trenches bounding many continental margins, together with many other geophysical (e.g. gravimetric) and geological observations, showed how the oceanic crust could disappear into the mantle, providing the mechanism to balance the extension of the ocean basins with shortening along its margins. 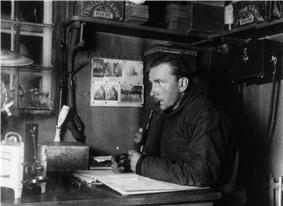 Alfred Wegener in Greenland in the winter of 1912-13. The discovery of radioactivity and its associated heating properties in 1895 prompted a re-examination of the apparent age of the Earth. This had previously been estimated by its cooling rate and assumption the Earth's surface radiated like a black body. Those calculations had implied that, even if it started at red heat, the Earth would have dropped to its present temperature in a few tens of millions of years. Armed with the knowledge of a new heat source, scientists realized that the Earth would be much older, and that its core was still sufficiently hot to be liquid. However, based on abnormalities in Himalayan gravitation, and seismic studies detected corresponding density variations. Therefore, by the mid-1950s, the question remained unresolved as to whether mountain roots were clenched in surrounding basalt or were floating on it like an iceberg. 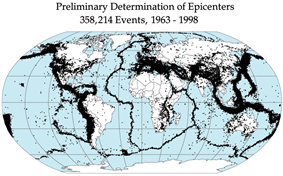 During the 20th century, improvements in and greater use of seismic instruments such as seismographs enabled scientists to learn that earthquakes tend to be concentrated in specific areas, most notably along the oceanic trenches and spreading ridges. By the late 1920s, seismologists were beginning to identify several prominent earthquake zones parallel to the trenches that typically were inclined 40–60° from the horizontal and extended several hundred kilometers into the Earth. These zones later became known as Wadati-Benioff zones, or simply Benioff zones, in honor of the seismologists who first recognized them, Kiyoo Wadati of Japan and Hugo Benioff of the United States. The study of global seismicity greatly advanced in the 1960s with the establishment of the Worldwide Standardized Seismograph Network (WWSSN) to monitor the compliance of the 1963 treaty banning above-ground testing of nuclear weapons. The much improved data from the WWSSN instruments allowed seismologists to map precisely the zones of earthquake concentration world wide. The discovery of magnetic striping called for an explanation. In the early 1960s scientists such as Heezen, Hess and Dietz had begun to theorise that mid-ocean ridges mark structurally weak zones where the ocean floor was being ripped in two lengthwise along the ridge crest (see the previous paragraph). New magma from deep within the Earth rises easily through these weak zones and eventually erupts along the crest of the ridges to create new oceanic crust. This process, at first denominated the "conveyer belt hypothesis" and later called seafloor spreading, operating over many millions of years continues to form new ocean floor all across the 50,000 km-long system of mid–ocean ridges. Continental drift theory helps biogeographers to explain the disjunct biogeographic distribution of present day life found on different continents but having similar ancestors. In particular, it explains the Gondwanan distribution of ratites and the Antarctic flora. Tectonic motion first began around three billion years ago. The movement of plates has caused the formation and break-up of continents over time, including occasional formation of a supercontinent that contains most or all of the continents. The supercontinent Columbia or Nuna formed during a period of and broke up about . The supercontinent Rodinia is thought to have formed about 1 billion years ago and to have embodied most or all of Earth's continents, and broken up into eight continents around . The eight continents later re-assembled into another supercontinent called Pangaea; Pangaea broke up into Laurasia (which became North America and Eurasia) and Gondwana (which became the remaining continents). There are dozens of smaller plates, the seven largest of which are the Arabian, Caribbean, Juan de Fuca, Cocos, Nazca, Philippine Sea and Scotia. Venus shows no evidence of active plate tectonics. There is debatable evidence of active tectonics in the planet's distant past; however, events taking place since then (such as the plausible and generally accepted hypothesis that the Venusian lithosphere has thickened greatly over the course of several hundred million years) has made constraining the course of its geologic record difficult. However, the numerous well-preserved impact craters have been utilized as a dating method to approximately date the Venusian surface (since there are thus far no known samples of Venusian rock to be dated by more reliable methods). Dates derived are dominantly in the range , although ages of up to have been calculated. This research has led to the fairly well accepted hypothesis that Venus has undergone an essentially complete volcanic resurfacing at least once in its distant past, with the last event taking place approximately within the range of estimated surface ages. While the mechanism of such an impressive thermal event remains a debated issue in Venusian geosciences, some scientists are advocates of processes involving plate motion to some extent. One explanation for Venus' lack of plate tectonics is that on Venus temperatures are too high for significant water to be present. The Earth's crust is soaked with water, and water plays an important role in the development of shear zones. Plate tectonics requires weak surfaces in the crust along which crustal slices can move, and it may well be that such weakening never took place on Venus because of the absence of water. However, some researchers remain convinced that plate tectonics is or was once active on this planet. In the 1990s, it was proposed that Martian Crustal Dichotomy was created by plate tectonic processes. Scientists today disagree, and believe that it was created either by upwelling within the Martian mantle that thickened the crust of the Southern Highlands and formed Tharsis or by a giant impact that excavated the Northern Lowlands. Some of the satellites of Jupiter have features that may be related to plate-tectonic style deformation, although the materials and specific mechanisms may be different from plate-tectonic activity on Earth. On 8 September 2014, NASA reported finding evidence of plate tectonics on Europa, a satellite of Jupiter - the first sign of such geological activity on another world other than Earth. On Earth-sized planets, plate tectonics is more likely if there are oceans of water; however, in 2007, two independent teams of researchers came to opposing conclusions about the likelihood of plate tectonics on larger super-earths with one team saying that plate tectonics would be episodic or stagnant and the other team saying that plate tectonics is very likely on super-earths even if the planet is dry. ^ Little, Fowler & Coulson 1990. ^ Read & Watson 1975. ^ Scalera & Lavecchia 2006. ^ Zhen Shao 1997, Hancock, Skinner & Dineley 2000. ^ Turcotte & Schubert 2002, p. 5. ^ Turcotte & Schubert 2002. ^ Turcotte & Schubert 2002, p. 3. ^ Schmidt & Harbert 1998. ^ Meissner 2002, p. 100. ^ "Plate Tectonics: Plate Boundaries". platetectonics.com. Retrieved 12 June 2010. ^ "Understanding plate motions". USGS. Retrieved 12 June 2010. ^ Mendia-Landa, Pedro. "Myths and Legends on Natural Disasters: Making Sense of Our World". Retrieved 2008-02-05. ^ van Dijk 1992, van Dijk & Okkes 1991. ^ Holmes, Arthur (1931). "Radioactivity and Earth Movements". Trans. Geological Society of Glasgow: 559–606. ^ Tanimoto & Lay 2000. ^ Smoot et al. 1996. ^ Spence 1987, White & McKenzie 1989. ^ a b Conrad & Lithgow-Bertelloni 2002. ^ Spence 1987, White & Mckenzie 1989, Segev 2002. ^ "Alfred Wegener (1880-1930)". University of California Museum of Paleontology. ^ Neith, Katie (April 15, 2011). "Caltech Researchers Use GPS Data to Model Effects of Tidal Loads on Earth's Surface". Caltech. Retrieved August 15, 2012. ^ van Dijk 1992, van Dijk & Okkes 1990). ^ Scoppola et al. 2006. ^ Torsvik et al. 2010. ^ a b Wegener 1929. ^ Wegener 1966, Hughes 2001b. ^ a b Runcorn 1956. ^ see for example the milestone paper of Lyman & Fleming 1940. ^ Korgen 1995, Spiess & Kuperman 2003. ^ Kious & Tilling 1996. ^ Carey 1956; see also Quilty 2003. ^ Holmes 1928; see also Holmes 1978, Frankel 1978. ^ Lippsett 2001, Lippsett 2006. ^ Mason & Raff 1961, Raff & Mason 1961. ^ Vine & Matthews 1963. ^ McKenzie & Parker 1967. ^ Moss & Wilson 1998. ^ Kranendonk, V.; Martin, J. (2011). "Onset of Plate Tectonics". Science 333 (6041): 413–414. ^ Torsvik, Trond Helge. "Reconstruction Methods". Retrieved 18 June 2010. ^ a b Torsvik 2008. ^ Scotese, C.R. (2002-04-20). "Climate History". Paleomap Project. Retrieved 18 June 2010. ^ a b Valencia, O'Connell & Sasselov 2007. ^ Bortman, Henry (2004-08-26). """Was Venus alive? "The Signs are Probably There. Astrobiology Magazine. Retrieved 2008-01-08. ^ Zhong & Zuber 2001. ^ Andrews-Hanna, Zuber & Banerdt 2008. ^ Wolpert, Stuart (August 9, 2012). "UCLA scientist discovers plate tectonics on Mars". Yin, An. UCLA. Retrieved August 13, 2012. ^ Dyches, Preston; Brown, Dwayne; Buckley, Michael (8 September 2014). "Scientists Find Evidence of 'Diving' Tectonic Plates on Europa". ^ Soderblom et al. 2007. Butler, Robert F. (1992). "Applications to paleogeography". Paleomagnetism: Magnetic domains to geologic terranes. Blackwell. Carey, S. W. (1958). "The tectonic approach to continental drift". In Carey, S.W. Continental Drift—A symposium, held in March 1956. Hobart: Univ. of Tasmania. pp. 177–363. Expanding Earth from p. 311 to p. 349. Condie, K.C. (1997). Plate tectonics and crustal evolution (4th ed.). Butterworth-Heinemann. p. 282. Foulger, Gillian R. (2010). "Plates vs Plumes: A Geological Controversy.". Wiley-Blackwell, 364 pp. Frankel, H. (1987). "The Continental Drift Debate". In H.T. Engelhardt Jr and A.L. Caplan. Scientific Controversies: Case Solutions in the resolution and closure of disputes in science and technology. Cambridge University Press. Hancock, Paul L.; Skinner, Brian J.; Dineley, David L. (2000). The Oxford Companion to The Earth. Hess, H. H. (November 1962). "History of Ocean Basins". In A. E. J. Engel, Harold L. James, and B. F. Leonard. Petrologic studies: a volume to honor of A. F. Buddington. Boulder, CO: Geological Society of America. pp. 599–620. Holmes, Arthur (1978). Principles of Physical Geology (3 ed.). Wiley. pp. 640–641. Joly, John (1909). Radioactivity and Geology: An Account of the Influence of Radioactive Energy on Terrestrial History. London: Archibald Constable. p. 36. Kious, W. Jacquelyne; Tilling, Robert I. (February 2001) . "Historical perspective". 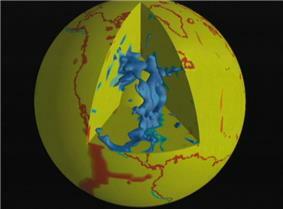 This Dynamic Earth: the Story of Plate Tectonics (Online ed.). Lippsett, Laurence (2006). "Maurice Ewing and the Lamont-Doherty Earth Observatory". In William Theodore De Bary, Jerry Kisslinger and Tom Mathewson. Living Legacies at Columbia. Columbia University Press. pp. 277–297. Little, W.; Fowler, H.W. ; Coulson, J. (1990). Onions C.T., ed. The Shorter Oxford English Dictionary: on historical principles II (3 ed.). Clarendon Press. Lliboutry, L. (2000). Quantitative geophysics and geology. Springer. p. 480. McKnight, Tom (2004). Geographica: The complete illustrated Atlas of the world. New York: Barnes and Noble Books. Moss, S.J. ; Wilson, M.E.J. (1998). "Biogeographic implications from the Tertiary palaeogeographic evolution of Sulawesi and Borneo". In Hall R, Holloway JD (eds). Biogeography and Geological Evolution of SE Asia (PDF). Leiden, The Netherlands: Backhuys. pp. 133–163. Oreskes, Naomi, ed. (2003). Plate Tectonics: An Insider's History of the Modern Theory of the Earth. Westview. Read, Herbert Harold; Watson, Janet (1975). Introduction to Geology. New York: Halsted. pp. 13–15. Schmidt, Victor A.; Harbert, William (1998). "The Living Machine: Plate Tectonics". Planet Earth and the New Geosciences (3 ed.). p. 442. Schubert, Gerald; Turcotte, Donald L.; Olson, Peter (2001). Mantle Convection in the Earth and Planets. Cambridge: Cambridge University Press. Smoot, N. Christian; Choi, Dong R.; Meyerhoff, Arthur Augustus; Bhat, Mohammad I.; Morris, A. E. L.; Agocs, W. B.; Kamen-Kaye, M.; Taner, I. (1996). 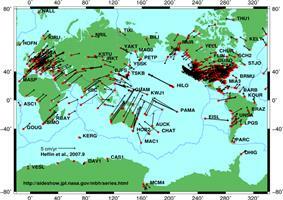 Surge tectonics: a new hypothesis of global geodynamics. Solid-State Science and Technology Library. Springer Netherlands. p. 348. Stanley, Steven M. (1999). Earth System History. W.H. Freeman. pp. 211–228. Sverdrup, H. U., Johnson, M. W. and Fleming, R. H. (1942). The Oceans: Their physics, chemistry and general biology. Englewood Cliffs: Prentice-Hall. p. 1087. Thompson, Graham R. and Turk, Jonathan (1991). Modern Physical Geology. Saunders College Publishing. Torsvik, Trond Helge; Steinberger, Bernhard (December 2006). "Fra kontinentaldrift til manteldynamikk" [From Continental Drift to Mantle Dynamics]. Geo (in Norwegian) 8: 20–30. Retrieved 22 June 2010. , translation: Torsvik, Trond Helge; Steinberger, Bernhard (2008). "From Continental Drift to Mantle Dynamics". In Trond Slagstad and Rolv Dahl Gråsteinen. Geology for Society for 150 years - The Legacy after Kjerulf 12. Trondheim: Norges Geologiske Undersokelse. pp. 24–38. Retrieved 18 June 2010 [Norwegian Geological Survey, Popular Science]. Turcotte, D.L. ; Schubert, G. (2002). "Plate Tectonics". Geodynamics (2 ed.). Wegener, Alfred (1929). Die Entstehung der Kontinente und Ozeane (4 ed.). Braunschweig: Friedrich Vieweg & Sohn Akt. Ges. Wegener, Alfred (1966). The origin of continents and oceans. Biram John (translator). Courier Dover. p. 246. Stein, Seth; Wysession, Michael (2009). An Introduction to Seismology, Earthquakes, and Earth Structure. Chichester: John Wiley & Sons. Andrews-Hanna, Jeffrey C.; Zuber, Maria T.; Banerdt, W. Bruce (2008). "The Borealis basin and the origin of the martian crustal dichotomy". Nature 453 (7199): 1212–5. Blacket, P.M.S. ; Bullard, E.; Runcorn, S.K., eds. (1965). A Symposium on Continental Drift, held in 28 October 1965. Philosophical Transactions of the Royal Society A 258 (1088). The Royal Society of London. p. 323. Bostrom, R.C. (31 December 1971). "Westward displacement of the lithosphere". Nature 234 (5331): 536–538. Connerney, J.E.P. ; Acuña, M.H. ; Wasilewski, P.J. ; Ness, N.F. ; Rème H., Mazelle C., Vignes D., Lin R.P., Mitchell D.L., Cloutier P.A. (1999). "Magnetic Lineations in the Ancient Crust of Mars". Science 284 (5415): 794–798. Connerney, J.E.P. ; Acuña, M.H. ; Ness, N.F. ; Kletetschka, G.; Mitchell D.L., Lin R.P., Rème H. (2005). "Tectonic implications of Mars crustal magnetism". Proceedings of the National Academy of Sciences 102 (42): 14970–14975. Conrad, Clinton P.; Lithgow-Bertelloni, Carolina (2002). "How Mantle Slabs Drive Plate Tectonics". Science 298 (5591): 207–9. Dietz, Robert S. (June 1961). "Continent and Ocean Basin Evolution by Spreading of the Sea Floor". Nature 190 (4779): 854–857. van Dijk, Janpieter; Okkes, F.W. Mark (1990). "The analysis of shear zones in Calabria; implications for the geodynamics of the Central Mediterranean". Rivista Italiana di Paleontologia e Stratigrafia 96 (2–3): 241–270. van Dijk, J.P.; Okkes, F.W.M. (1991). "Neogene tectonostratigraphy and kinematics of Calabrian Basins: implications for the geodynamics of the Central Mediterranean". van Dijk, Janpieter (1992). "Late Neogene fore-arc basin evolution in the Calabrian Arc (Central Mediterranean). Tectonic sequence stratigraphy and dynamic geohistory. With special reference to the geology of Central Calabria". Geologica Ultrajectina 92: 288. Frankel, Henry (July 1978). "Arthur Holmes and continental drift". The British Journal for the History of Science 11 (2): 130–150. Harrison, C.G.A. (2000). "Questions About Magnetic Lineations in the Ancient Crust of Mars". Science 287 (5453): 547a. Heezen, B. (1960). "The rift in the ocean floor". Scientific American 203 (4): 98–110. Heirtzler, James R.; Le Pichon, Xavier; Baron, J. Gregory (1966). "Magnetic anomalies over the Reykjanes Ridge". Deep Sea Research 13 (3): 427–432. Holmes, Arthur (1928). "Radioactivity and Earth movements". Transactions of the Geological Society of Glasgow 18: 559–606. Hughes, Patrick (8 February 2001). "Alfred Wegener (1880-1930): A Geographic Jigsaw Puzzle". On the shoulders of giants. Earth Observatory, NASA. Retrieved 2007-12-26. ... on January 6, 1912, Wegener... proposed instead a grand vision of drifting continents and widening seas to explain the evolution of Earth's geography. Kasting, James F. (1988). "Runaway and moist greenhouse atmospheres and the evolution of Earth and Venus". Icarus 74 (3): 472–494. Korgen, Ben J. (1995). "A voice from the past: John Lyman and the plate tectonics story" (PDF). Oceanography (The Oceanography Society) 8 (1): 19–20. Lyman, J.; Fleming, R.H. (1940). "Composition of Seawater". Journal of Marine Research 3: 134–146. Mason, Ronald G.; Raff, Arthur D. (1961). "Magnetic survey off the west coast of the United States between 32°N latitude and 42°N latitude". Bulletin of the Geological Society of America 72 (8): 1259–1266. Mc Kenzie, D.; Parker, R.L. (1967). "The North Pacific: an example of tectonics on a sphere". Nature 216 (5122): 1276–1280. Moore, George W. (1973). "Westward Tidal Lag as the Driving Force of Plate Tectonics". Geology 1 (3): 99–100. Morgan, W. Jason (1968). 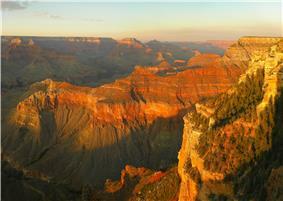 "Rises, Trenches, Great Faults, and Crustal Blocks". Journal of Geophysical Research 73 (6): 1959–1982. Le Pichon, Xavier (15 June 1968). "Sea-floor spreading and continental drift". Journal of Geophysical Research 73 (12): 3661–3697. Quilty, Patrick G.; Banks, Maxwell R. (2003). "Samuel Warren Carey, 1911-2002". Biographical memoirs. Australian Academy of Science. Retrieved 2010-06-19. This memoir was originally published in Historical Records of Australian Science (2003) 14 (3). Raff, Arthur D.; Mason, Roland G. (1961). "Magnetic survey off the west coast of the United States between 40°N latitude and 52°N latitude". Bulletin of the Geological Society of America 72 (8): 1267–1270. Runcorn, S.K. (1956). "Paleomagnetic comparisons between Europe and North America". Proceedings, Geological Association of Canada 8: 7785. Scalera, G., and Lavecchia, G. (2006). "Frontiers in earth sciences: new ideas and interpretation". Annals of Geophysics 49 (1). Scoppola, B.; Boccaletti, D.; Bevis, M.; Carminati, E.; Doglioni, C. (2006). "The westward drift of the lithosphere: A rotational drag?". Geological Society of America Bulletin 118: 199–209. Segev, A (2002). "Flood basalts, continental breakup and the dispersal of Gondwana: evidence for periodic migration of upwelling mantle flows (plumes)". EGU Stephan Mueller Special Publication Series 2: 171–191. Sleep, Norman H. (1994). "Martian plate tectonics". Journal of Geophysical Research 99: 5639. Soderblom, Laurence A.; Tomasko, Martin G.; Archinal, Brent A.; Becker, Tammy; L. Bushroe, Michael W.; Cook, Debbie A.; Doose, Lyn R.; Galuszka, Donna M.; Hare, Trent M.; Howington-Kraus, Elpitha; Karkoschka, Erich; Kirk, Randolph L.; Lunine, Jonathan I.; McFarlane, Elisabeth A.; Redding, Bonnie L.; Rizk, Bashar; Rosiek, Mark R.; See, Charles; Smith, Peter H. (2007). "Topography and geomorphology of the Huygens landing site on Titan". Planetary and Space Science 55 (13): 2015–2024. Spence, William (1987). ref=CITEREFSpence1987 "Slab pull and the seismotectonics of subducting lithosphere". Reviews of Geophysics 25 (1): 55–69. Spiess, Fred; Kuperman, William (2003). "The Marine Physical Laboratory at Scripps" (PDF). Oceanography (The Oceanography Society) 16 (3): 45–54. Tanimoto, Toshiro; Lay, Thorne (7 November 2000). "Mantle dynamics and seismic tomography". Proceedings of the National Academy of Sciences 97 (23): 12409–12410. Thomson, W (1863). "On the secular cooling of the earth". Philosophical Magazine 4 (25): 1–14. Torsvik, Trond H.; Steinberger, Bernhard; Gurnis, Michael; Gaina, Carmen (2010). "Plate tectonics and net lithosphere rotation over the past 150 My". Earth and Planetary Science Letters 291: 106–112. Valencia, Diana; O'Connell, Richard J.; Sasselov, Dimitar D (November 2007). "Inevitability of Plate Tectonics on Super-Earths". Astrophysical Journal Letters 670 (1): L45–L48. Vine, F.J.; Matthews, D.H. (1963). "Magnetic anomalies over oceanic ridges". Nature 199 (4897): 947–949. Wegener, Alfred (6 January 1912). "Die Herausbildung der Grossformen der Erdrinde (Kontinente und Ozeane), auf geophysikalischer Grundlage". Petermanns Geographische Mitteilungen 63: 185–195, 253–256, 305–309. White, R.; McKenzie, D. (1989). "Magmatism at rift zones: The generation of volcanic continental margins and flood basalts". Journal of Geophysical Research 94: 7685–7729. Wilson, J.T. (8 June 1963). "Hypothesis on the Earth's behaviour". Nature 198 (4884): 849–865. Wilson, J. Tuzo (July 1965). "A new class of faults and their bearing on continental drift". Nature 207 (4995): 343–347. Wilson, J. Tuzo (13 August 1966). "Did the Atlantic close and then re-open?". Nature 211 (5050): 676–681. Zhen Shao, Huang (1997). "Speed of the Continental Plates". The Physics Factbook. Zhao, Guochun, Cawood, Peter A., Wilde, Simon A., and Sun, M. (2002). "Review of global 2.1–1.8 Ga orogens: implications for a pre-Rodinia supercontinent". Earth-Science Reviews 59, pp. 125–162. Zhao, Guochun, Sun, M., Wilde, Simon A., and Li, S.Z. (2004). "A Paleo-Mesoproterozoic supercontinent: assembly, growth and breakup". Earth-Science Reviews, 67, pp. 91–123. Zhong, Shijie; Zuber, Maria T. (2001). "Degree-1 mantle convection and the crustal dichotomy on Mars". Earth and Planetary Science Letters 189: 75. The PLATES Project. Jackson School of Geosciences. GPlates, desktop software for the interactive visualization of plate-tectonics. Google Map of the Topography of Plate Tectonics that enables you to zoom in on submarine mid ocean ridges, fracture zones, ocean trenches, thermal vents and submarine volcanoes.